Marsh, James H.. "Bobby Hull". The Canadian Encyclopedia, 03 January 2018, Historica Canada. https://www.thecanadianencyclopedia.ca/en/article/bobby-hull. Accessed 25 April 2019. Hull won the Art Ross Trophy 3 times, the Hart Trophy twice and the Lady Byng Trophy once, scoring 610 goals and 1170 points in 15 NHL seasons. In 1972 he accepted $1 million to jump from the NHL to the Winnipeg Jets, giving immediate credibility to the fledgling World Hockey Association. Hall of Famer Bobbie Hull in a game between the Black Hawks and Maple Leafs, 1960 (courtesy Library and Archives Canada/C-29558). Robert Marvin "Bobby" Hull, hockey player (b at Pointe Anne, Ont 3 Jan 1939). He played junior hockey in Hespeler (Cambridge), Woodstock and St Catharines and joined the Chicago Black Hawks in 1957. Though he scored only 31 goals in his first 2 seasons, he was the runner-up to Frank Mahovlich for the Calder Trophy in his first season. Hull developed a fearsome slapshot (clocked at 187 km/h) and went on to become the highest-scoring left winger in hockey history. His nickname "Golden Jet" aptly described him in motion, and his speed, power and drive epitomized the sport of hockey. 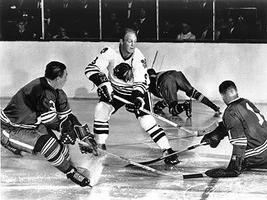 He led Chicago to its first Stanley Cup victory in 23 years (1960-61), then dramatically equalled the record of 50 goals in a season (1961-62) and raised it to 54 (1965-66) and 58 (1968-69). 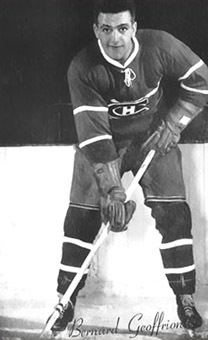 Along with his teammate Stan Mikita, Hull made a unique contribution to hockey through the development of a specialized hockey stick; its curve gave the player's shot more velocity and accuracy. 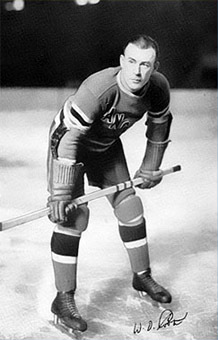 Hull won the Art Ross Trophy 3 times, the Hart Trophy twice and the Lady Byng Trophy once, scoring 610 goals and 1170 points in 15 NHL seasons. In 1972 he accepted $1 million to jump from the NHL to the Winnipeg Jets, giving immediate credibility to the fledgling World Hockey Association. There he continued his prolific scoring, with 77 goals in 78 games in 1974-75, adding 303 goals and 638 points to his totals. He attempted a comeback in 1981 with the New York Rangers but was released in training camp. His son, Brett, emerged as a superstar with the St Louis Blues, and they became the first father and son to have 50-goal seasons in the NHL and to win the Hart Trophy. Angered over the NHL's administration of the pension fund for retired players, Hull joined several veteran players including Gordie Howe and Carl Brewer in taking the league to court over surplus monies that the pension fund had produced. The players were successful and gained over $40 million to supplement the pensions of retired players. Hull is a member of the Order of Canada (1978) and the Hockey Hall of Fame (1983). Upon retirement he resumed another lifelong interest, cattle ranching.